"We care, develop and believe - together we achieve"
The staff of Salesian College is committed to creating a caring environment, to fostering respect for self, for others, for all creation and for truth, to help each member of the school community to develop fully, and to providing students with the skills that they need to meet life's challenges with confidence. Salesian Ethos is grounded in a Christian spirituality as lived by St. Francis de Sales. 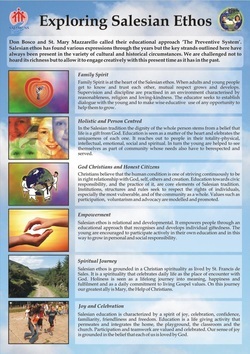 It is a spirituality that celebrates daily life as the place of encounter with God. Holiness is seen as a lifelong journey into meaning, happiness and fulfilment and as a daily commitment to living Gospel values. For Don Bosco, the founder of the Salesians, this is a journey that young and old can take together throughout their life. In a Salesian School, truth finds expression in word and deeds. The focus of education is twofold: to create Good Christians and Honest Citizens. As Christians we believe that the human condition is one of striving continuously to be in right relationship with God, self, other and creation. 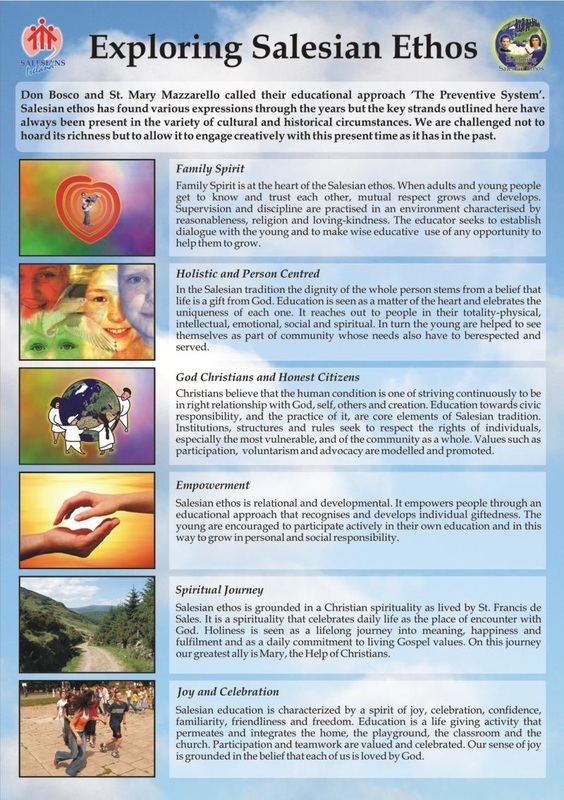 In the Salesian tradition, institutions and their structures and programmes, seek to balance the rights of individuals, especially the most vulnerable, with those of the community as a whole. Education towards civic responsibility and its practices begins with the educative relationship between teacher and student. Love of God and love of neighbour go hand in hand. In the Salesian educative approach, known as the Preventive System, the educator has a special place and a particular responsibility for the educative relationship that is established with the young person and for the learning environment itself. This relationship draws on the Salesian principles of Reasonableness, Religion and Loving-kindliness. By seeking to be reasonable in our dealings as educators with the young it is believed that the young will be encouraged to be reasonable in their dealings with each other and authority. Our teaching sets out to encourage the student openness to differing experiences and the development of appropriate skills in critical thinking and values. In a Salesian heart there is always a place for joy and hope. The Christian story is to be told and celebrated, as is daily life. Gospel values, and their practice, pervade the whole school, its teaching learning processes and its community of relationships. For inspiration on loving-kindliness we look to the image of Jesus the Good Shepherd, the ones who knows his flock and leads them to fresh pastures, the one who goes in search of the lost sheep and the one who even in the moments of great darkness and pain can forgive and hope because of his own trust in a loving God. Such is the model of our relationships with our pupils.